Dredze, who also is a research scientist at the Johns Hopkins Human Language Technology Center of Excellence, led a team that in mid-2011 released one of the first and most comprehensive studies showing that Twitter data can yield useful public health information. Since then, this strategy has become so popular that the U.S. Department of Health and Human Services last summer sponsored a contest challenging researchers to design an online application that could track major disease outbreaks. This winter, as the United States entered an unusually severe and early flu season, Twitter-based flu projections have drawn increasing attention. Many public tweets, such as, “I’m so sick this week with the flu,” can indicate a rise in the flu rate. Collecting enough of these tweets can help health officials gauge the scope and severity of an epidemic. Another advantage of the Johns Hopkins flu projection method is that it can produce real-time results. By comparison, the U.S. Centers for Disease Control and Prevention, which record flu-related symptoms from hospital visits, typically take two weeks to publish data on the flu’s prevalence. The researchers have also used their Twitter data to produce United States maps that document the stark differences between last year’s mild flu season and the much higher incidence of the virus in the winter of 2012-2013. These U.S. maps indicate the Twitter system’s rate of influenza in each state in the first week of January (higher flu rates are marked with darker red). They show that the country is awash in a high flu rate in 2013 (the bottom map), yet was relatively unscathed during the same week in 2012 (the top map). While their new method was only recently developed, the Johns Hopkins researchers chose to release information on the flu tracking system because of the higher incidence of illness this winter. Team members hope to share the enhanced flu tracking method with leading government health agencies. 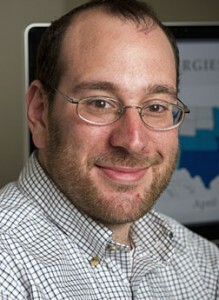 Other Johns Hopkins researchers participating in the Twitter flu project are doctoral student Michael Paul and recent bachelor’s degree graduate Alex Lamb, both in the Department of Computer Science. The Johns Hopkins researchers noted that their enhanced Twitter flu analysis system looked only at public tweets in which all user names and gender information had been removed. The system was tested only on messages from the United States. The research was funded in part by the National Institutes of Health’s Models of Infectious Disease Agent Study. The video above was produced by Twitter last year to call attention to Johns Hopkins’ use of tweets to track public health trends. Read an earlier news release about Johns Hopkins’ use of tweets to track public health trends here. Color U.S. flu maps and video available; contact Phil Sneiderman.